ROXAS CITY, Capiz, Jan. 13 (PIA) – A seminar about the Electronic blotter or E-blotter system will be conducted by the Police Regional Office (PRO6) next week as part of the Philippine National Police’s strategies to develop a more efficient electronic blotter system for recording crime incidents across the country. PRO6 director Chief Supt. Cipriano E. Querol, Jr. said the project intends to have daily updates on what is really happening on the ground, particularly in every police station, which is vital in mapping out strategies for quick response and crime prevention. “We will make Roxas City Police Station (RCPS) as one of the pilot sites of the project,” Querol noted. 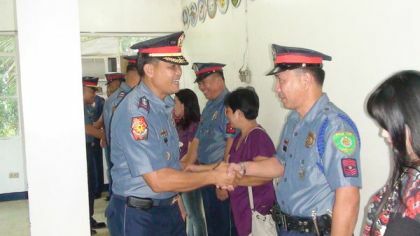 The region’s top cop graced the turn over of command ceremony of RCPS last Jan. 12, which installed Supt. Salvador Dagoon as new Roxas City police director. Dagoon succeeded outgoing RCPS chief Supt. Kashmir Disomangcop. The e-Blotter is designed as a stand-alone system that will be installed in all police stations. It will report and monitor all crime incidents that transpired within their respective areas as well as the results and records of the investigation.